Horizon Communications | Who are we? Qualifications & My Approach To PR – The short, concise answer: check my LinkedIn profile Crunchbase profile and watch this video. The long marketing answer: As the Principal of Horizon, Jonathan Hirshon (named ‘Silicon Valley Guru’ by BusinessWeek) has exclusively focused on high-tech PR and marketing over the last 30 years, with extensive corporate and agency experience. Jonathan’s counsel and campaigns are interwoven with Silicon Valley’s history of success and innovation – through his expertise and vision, Horizon was awarded Agency of Record status at Apple and other Fortune 100 companies. In addition, many acclaimed startups have attributed a large part of their success to his specific involvement with their launch and ongoing activities. There is an elegance, rigor and dynamism in true PR – these are the characteristics that define Horizon’s communications programs, counsel and approach. Jonathan has gained the respect of leading media, analysts and peers for his in-depth technical knowledge as well as his unique blend of passionate evangelism, reflective counsel and intuitive understanding of PR and market dynamics. He has not only architected some of the most successful launches and publicity campaigns in Silicon Valley history – he has even been involved in product engineering and hardware design for his clients! Jonathan was the PR manager for Sony Corporation in its heyday, representing the company’s far-flung ‘non-consumer’ business units – at the age of 25, he was acclaimed as one of the youngest managers in Sony corporate history. Sony products in the non-consumer area include professional audio/video equipment, computers, peripherals and semiconductors. As a key member of the headquarters corporate communications staff, his role included counseling top management, day-to-day product PR responsibility and control of a million dollar+ budget – all within a few years of graduating college. A member of IEEE (the Institute of Electrical and Electronics Engineers) for the past 20 years and also a past member of SMPTE (the Society of Motion Picture and Television Engineers), Jonathan is a synthesis of marketeer and engineer and represents a unique resource to his clients. His technical and communications prowess, reclusiveness and insistence on representing only those companies meeting his high standards have also contributed to the ‘Horizon Mystique’. His ability to arrange BusinessWeek and Forbes cover stories, as well as articles in leading business, consumer and high-tech venues without compromising the standards of his journalist friends or his clients is a hallmark of the company. • The San Francisco J! Jonathan was also invited to be part of the San Jose Mercury News ‘Rethink Project’ as well as providing counsel related to citizen journalism. One of his most interesting positions was as a technical advisor to the famous “Band of Angels”, advising its members on the technical and market realities and opportunities surrounding each presenting startup. Jonathan was a regular contributing editor for 3D Magazine, as well as writing for publications such as Electronic Engineering Times and gigaom.com. He has been a contributor to RCR Wireless, TechCrunch and Business Insider as both a writer and industry commentator. Jonathan has also been invited to present at several prestigious venues, including the Reuters Foundation Digital Vision Program at Stanford University. He is a frequent guest lecturer at educational and local community programs, most recently as an invited speaker at the Spuler Media Ethics Symposium at San Jose State University. He is also the author of a highly-acclaimed ebook of haiku and blogs regularly as the feared yet beloved despot of cuisine at The Food Dictator. His long-standing annual trip to the Arctic every January has been profiled on Business Insider. Jonathan is a renowned epicurean, wine connoisseur and chef, with additional passions for history, poetry, philosophy, art, music, the sciences and a number of other subjects (both abstruse and mundane). Jonathan was a 6-year member of the Board of Trustees at a 150 year old Synagogue and was honored by the Men of Reform Judaism in 2010 as a “Man of the Year” for his many contributions to charity, inter-faith dialogue and educational activities. His unique sense of humor is a source of constant amusement (and/or bemusement) to his friends, family and colleagues. A known travel addict, Jonathan has devoted a large part of his life to exploring the world (with much of it still to go!) – 450+ cities in 33 countries at last count. 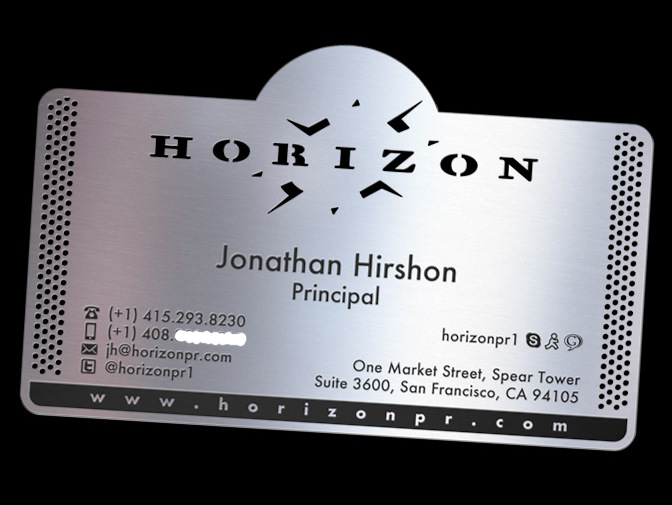 ‘JH’ is also recognized for having the epitome in cool (and versatile) business cards! 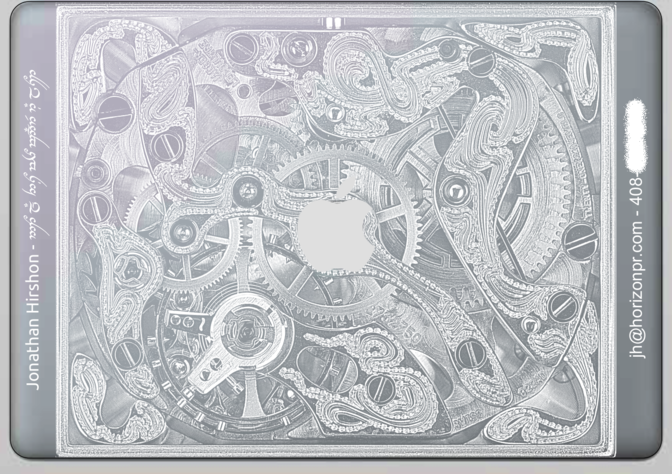 (and for the record, they are not aluminum, as noted by CNET – they are in fact acid-etched solid steel and have since moved onto the displayed Rev 3.0 design).